Hopefully this post won’t get too long, even though I’m recounting 2 days. We’ll see how it goes. Feedback is much appreciated. Day 3 programming was rather uneventful. We spent a few hours going over orientation-like things, mainly what the program entailed and rules to follow. Pretty basic/boring stuff that I won’t concern you with. Oh wait, I think there may have been another icebreaker game. Maybe? Probably. Morgan and me on a bridge overlooking Gordon Beach. After about 5 hours of being talked at, it was finally time to go home. 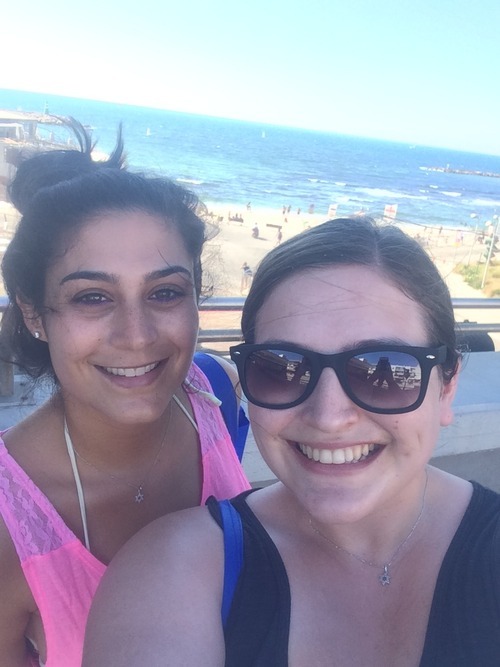 My roommate Morgan and I really wanted to go to the beach, so I lathered myself in sunscreen and we walked to Gordon Beach, the most famous beach in Tel Aviv. It was gorgeous. Seriously. We were there for about an hour before some other people from our program came and joined us. 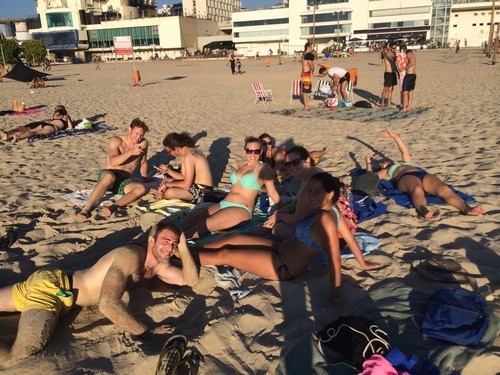 We all went in the water, played volleyball, and just relaxed for a few hours. A few of us at Gordon Beach. See if you can spot which one is me! We left as the sun was setting, and it was still pretty warm. Have I mentioned how hot it is here yet? No? Well it’s pretty darn hot. It’s a humid heat too. I guess that’s what I get for moving to the middle of the desert. When we got back to our apartment, I fully unpacked all of my clothes (finally) and went to bed. Day 4 started with something I had not done since my Milken days: a Hebrew test. Yes, day 4 was Ulpan evaluation day. For those that don’t know, Ulpan is a course to teach Hebrew as effectively as possible in a short amount of time. Our particular Ulpan course, Ulpan-Or, is supposed to be the best Ulpan out there, so I’m really hoping that by the end of my course, my Hebrew is going to be better. We were broken up into 2 groups in the beginning of the day, so half were with me at Ulpan and the other half were doing the other activity, which I’ll talk about below. The evaluation test consisted of listening to a few audio tracks and writing, in Hebrew, what we understood about the situations. Then after completing that, we met with the founder of Ulpan-Or and she spoke to us to see what our skills were. Personally, I’ve always been better at writing and reading in Hebrew than speaking it, so I felt pretty good about the first portion and shaky about the second. I ended up being placed in level Gimel (the third letter of the Hebrew Alphabet, meaning I was in level 3 out of 5). Not too shabby. 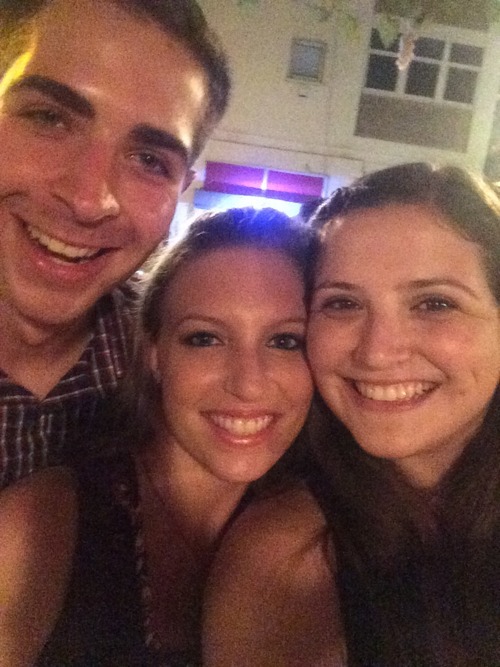 We then listened to what it would be like to intern in Israel. Apparently, internships are a fairly new concept in Israel, unlike in the US, and many companies that hire interns don’t always know how best to utilize their interns. I was told that bluntness is acceptable and giving suggestions (within reason) is welcome. I’m also allowed to tell them what I want to do. This will definitely be an interesting experience. I will be sure to keep you guys posted on that. After that, a few employers from some companies still looking for interns were there to answer questions. While many of the answers actually were helpful, we had been sitting for so long at that point that none of us really wanted to listen anymore. We finished at like 4-ish and headed home where we met our 4th roommate, Yael! Yael is really sweet, and she’s sharing a room with me; I think we’ll be getting along well. About an hour after Yael got there, it was time for us to leave for a “mandatory party.” Yes, you read that right. A mandatory party. The program organizers arranged for us to get buy one get one free drinks at a place called “Patio Bar.” Yes, we sat out on the patio of Patio. It was a lovely patio. But thank goodness those drinks were half price. Tel Aviv is expensive, man. 48 shekels for a screwdriver (about $14)? But it was still really fun and great to talk to people in a more casual setting. It’s now just a few hours before Shabbat begins, so I will catch you up soon!